Obesity and depression both dramatically increase health care costs, but they mainly act separately, according to a study published in the November 2011 Journal of General Internal Medicine by Group Health Research Institute scientists. Gregory Simon, MD, MPH, a Group Health psychiatrist and Group Health Research Institute senior investigator, led the research. "Previous research shows that both depression and obesity are associated with higher health care costs," he said. "But depression and obesity often occur together, so it was important to know if the relationship between obesity and cost is really due to depression -- or vice versa." Simon and his colleagues tested whether depression confounds the increase in health care use that is associated with obesity. Confounding means an apparent connection -- such as the link between increased health care costs and obesity -- is influenced or even caused by a third factor. In this study, the authors tested if depression confounds the increase in health care seen in obese patients. The study used telephone interviews to determine obesity and depression, and Group Health's extensive medical records to calculate health care costs for 4,462 women aged 40-65. All were enrolled in Group Health Cooperative, a nonprofit health care system in Washington and northern Idaho. Obesity was measured as body mass index (BMI), a standard obesity measure that is calculated from height and weight. A BMI below 25 is considered normal weight, 25-30 considered overweight, and over 30 is considered obese. Depression was measured with a 9-item American Psychiatric Association questionnaire. • In middle-aged women, health care costs increased with obesity. Specifically, costs increased 65 percent in women with a BMI of 30-35, and 157 percent in women with a BMI higher than 35, compared to women of normal weight. • The trend was similar for all types of health care that the researchers examined: primary care, outpatient prescriptions, specialist visits, inpatient care, and mental health care. • Health care costs increased with higher depression scores, but depression was a not a major confounder of the obesity results. • Even accounting for depression, health costs increased with every rise in BMI category. 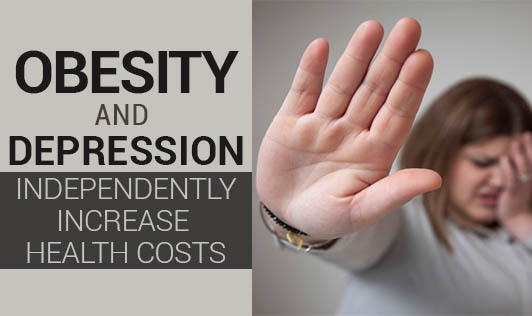 The study concluded that in this population of women, obesity is associated with higher health care costs, but not because of co-occurring depression. Similarly, depression is associated with higher costs, but not because of co-occurring obesity. These higher costs have an economic impact. Increased costs associated with depression were spread across all types of health care, not just mental health care. "Obesity and depression are both very common," Dr. Simon said, "so the increased costs we find add up to a very large amount in the general population." The relationships among obesity, depression, and chronic illness related to obesity are complex, as are the effects of depression on behavior and health. But one thing is clear, the study's authors said: Effective obesity prevention is a crucial factor in tackling our rising health care costs. The National Institute of Mental Health funded the work.